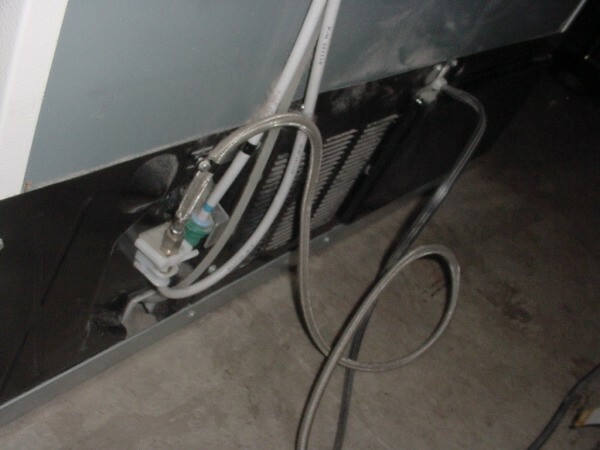 There are occasions, such as after a repair, that you may need to flush the water supply line for your refrigerator. This is a guide about flushing a refrigerator water line. I have had a side by side refrigerator in our garage for about two years and it is not hooked up to water. However, the dispenser area continues to be moist and is quite moldy. Can we rehook this up to water and use the ice maker and dispenser or have we ruined it altogether. Thank you! You should be able to clean this with baking soda and salt mixture. Mix your baking soda with salt. Add a few drops of water to make a paste. Use an old toothbrush to scrub the mold off the unit. How do I clean the inside of the plastic ice maker line? It looks gunky below the faucet under the sink before it travels under the floor to the fridge. Is there a way of disconnecting the line and cleaning it out with a Q-tip? I use a Flo Jet pump and a 5 gallon bottle of water to feed the water supply to my Whirlpool fridge. My question is do I have to have the fridge filter in place? The Flo Jet company said to remove the filter in order for the pump to work properly. Is there a easy way to clean the water line out for the ice maker and water dispenser on a 1993 Kenmore side by side refrigerator, model 596.9? I have a Maytag fridge, model# MZD2665HEQ. I want to flush the water lines to take the musty taste out of them so I can drink the water again. It just doesn't taste good. How do you clean the water lines to the refrigerator without replacing them? I need to find out if there is any way to clean (instead of replace) the lines and water reservoir in my "Whirlpool" refrigerator icemaker/water unit. Someone suggested vinegar, but I would like to know if there is anything to force [under pressure] the vinegar (or other cleaner) through the line and reservoir to make sure they are clean. Vinegar is a good unclogger and de-liming agent, but I don't know if you can get to the lines to force water through them. Try placing baking soda in the lines and then pouring in hot vinegar. I've used this in my sink drain and the combination creates a volcano effect. Since I don't know the logistics of the lines and water reservoir in your refrigerator (are they removable, for instance), this may not be a viable solution, but I thought it was worth a try.